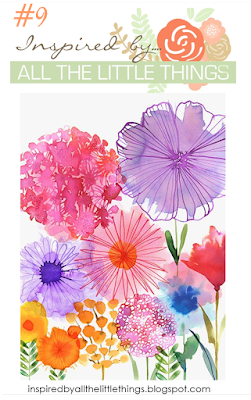 Over at Inspired By All The Little Things Blog, they have this bright spring floral this week. I also wanted to play a bit more with my Happy Wishes Stamps and Dies by WPLUS9 Design Studio. Recently, I was able to purchase several Distress Ink Cubes for $2.00 each and get free shipping at the same time, so I picked a couple of handfuls in some colors that I already knew I liked because I have Distress Markers in those colors and use them regularly for water coloring. Spun Sugar, Worn Lipstick, Peacock Feathers, Ripe Persimmon, Picked Raspberry, Dusty Concord, Mowed Lawn and Seedless Preserves were all in my top picks. These colors are rich and vibrant and I love the small size that allows me to try more colors with a lot less space to store them in than traditional ink pads. More and more I am finding that I am switching over to the small size and they are really fantastic to use with the MISTI. While the colors are very rich and vibrant, I am also finding that I like to double stamp my images to get the deeper color which is of course, only possible since I am using the MISTI Stamping Tool. For today's cards, I am using the Simon Says Stamp Wavy Scallop Stitches on a piece of Stamper's Select White 110# Cardstock. After I made one cut, I rotated the die 180 degrees and cut in the other direction to give me the swoopy element for my flowers and leaves. This was a fun way to add some visual interest to an otherwise plain card base. All of the flowers and leaves are cut from Stamper's Select White 110# Cardstock as well. The Happy Birthday Sentiment Die is from Penny Black. Both note cards (Berry Sorbet & Autumn Rose) were spritzed with Iridescent Gold Shimmer Mist and allowed to dry before I started adhering the decorative elements. Happy Tuesday, everyone! I hope you have a chance to stop by the Challenge Blog and play along with us or just look around to see all the designs. It's always inspiring to see how other designers view the challenges. Oh, these are so pretty! Wonderful takes on the inspiration photo! Both of these cards are fabulous! The wavy scalloped die is so cool too! Thanks for playing along at Inspired by All Things Little where I am guesting! LOVE your chain of blooms! Thanks for playing at Inspired By! This is a very cool design! Love those pretty blooms! So happy you joined us at Inspired by All the Little Things! Lovely! Love the pretty blooms! Thanks so much for joining us at Inspired By All the Little Things!